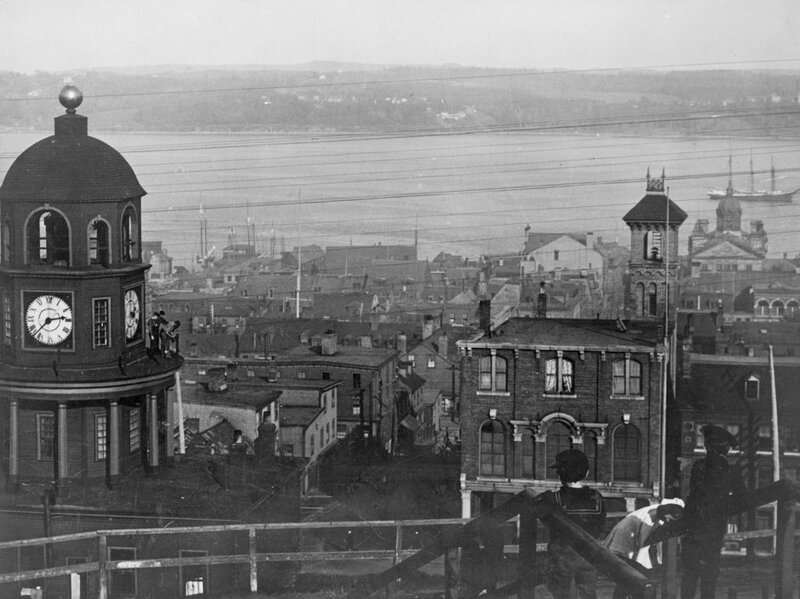 The view looking east toward downtown Halifax from Citadel Hill, around 1900-1917. Image courtesy of the Library of Congress. It isn’t in New England, or even in the United States, but Halifax has long had close ties with New England, especially Boston. It is the closest major North American port to Europe, and as such it is the last stop for outgoing ships from Boston, and the first for incoming ships. This scene here shows part of the city’s massive harbor, which has been of strategic importance over the years. After the British occupation of Boston ended in 1776, their fleet took refuge here in Halifax while preparing for an assault on New York City, and many years later the harbor was used as a gathering place for eastbound Atlantic convoys in both world wars. Through all of this, the strategically-valuable harbor has been protected by Fort George, a series of fortifications atop Citadel Hill. The hill stands just west of downtown Halifax, offering sweeping views of the city and harbor, and making it the ideal location for a fort to command the harbor and its approaches. The photos here were taken near the top of the hill, near the outer walls of the fort. On the left is one of Halifax’s oldest landmarks, the Town Clock, which was built at the foot of the hill. It faces down Carmichael Street, which leads to the Grand Parade three blocks down the hill, where City Hall and St. Paul’s Anglican Church are located. The date of the first photo is somewhat unclear, but it was taken sometime soon before 1917, when Halifax experienced one of the deadliest disasters in history. Known as the Halifax Explosion, it occurred on December 6, 1917, when the harbor was filled with ships heading to and from Europe during World War I. Two such ships were the Norwegian SS Imo, which collided with French ammunition ship SS Mont-Blanc. The latter caught fire, and after about 20 minutes its cargo of high explosives detonated. The Mont-Blanc was essentially vaporized, and the blast wave leveled much of the northern part of the city, to the left and out of view in the photos here. A few earlier posts, here and here, show scenes from the aftermath of the explosion, which killed nearly 2,000 people, injured around 9,000 others, and damaged or destroyed around 12,000 houses. The main commercial center of Halifax, seen in this view from Citadel Hill, escaped serious damage. Essentially every window in the city was shattered by the explosion, but most of the buildings in the first photo would have survived the disaster. Despite being spared from serious damage, there is very little that is still recognizable from the first photo a century later. There are a number of 19th century buildings scattered throughout this section of the city, but the only one that is readily visible in both photos is the clock tower itself, which remains a prominent city landmark. Today, Halifax remains an important port. It is the largest city in Canada’s Maritime provinces, and its downtown has been built up with skyscrapers, partially obscuring the view of the harbor from Citadel Hill. The shoreline across the harbor in Dartmouth has also changed dramatically in the past 100 years. 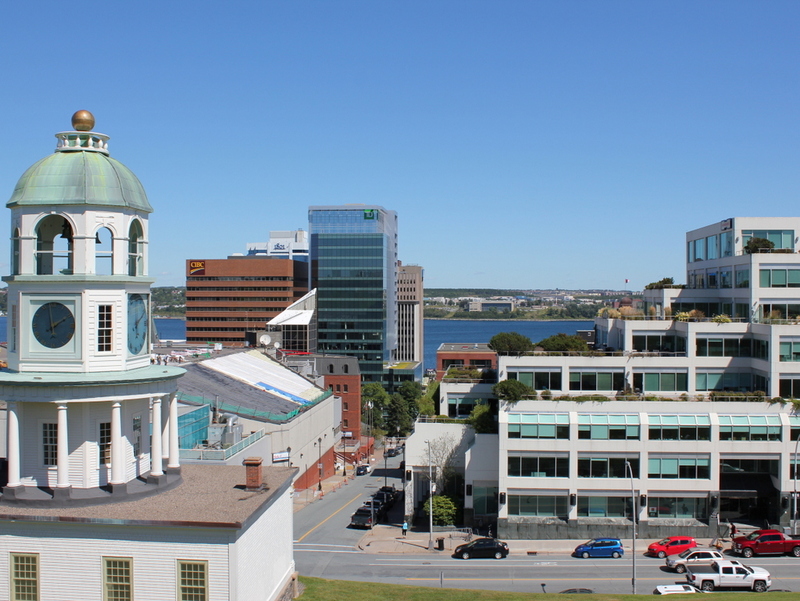 In 1911, the community had a population of just over 5,000, but today it has over 67,000 people, and is a major suburb of Halifax as well as a commercial center in its own right.